Warhammer 40,000 Collectibles in EPIC 1:6 Scale! Warhammer fans have plenty to look forward to as HMO announces an official partnership with Games Workshop to produce a line of amazing Warhammer 40,000 statue collectibles. The most iconic of Warhammer 40,000 characters brought to life with this collaboration, and the fantasy of seeing your favourite characters in high definition detailed large scale will now become reality. You can expect greatness true to the original source art as the HMO creative team (behind sold-out collectibles like Ren and Capcom's Mega Man X) works closely with the Games Workshop team! The new line boasts some serious action in 1:6 scale dioramas of defining Warhammer 40,000 scenes. 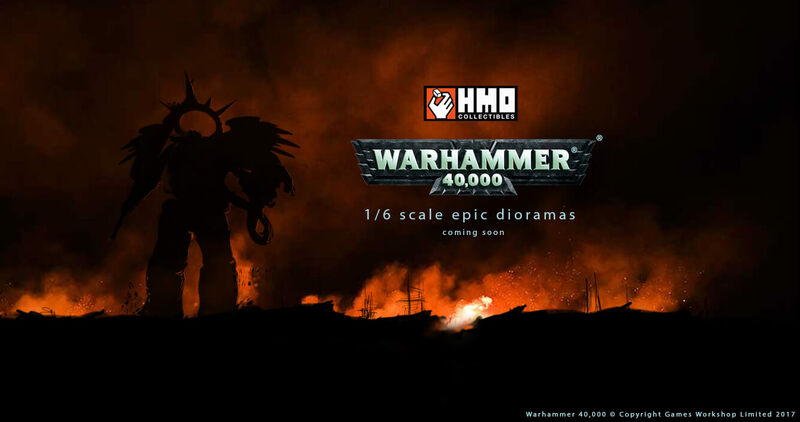 "The optimal scale of 1:6 in diorama form will allow us to bring the best elements of Warhammer 40,000, which include the dynamism and clash between the characters, to the fan's desk," said Mr Mufizal, HMO's lead of the Creative Team. We are extremely excited to show you what we have been working on and updates will be coming to you very soon. To get in on this line before anyone else.. Simply scroll down and key in your E-mail address for first-hand updates from the HMO Team! The “HMO” in HMO Collectibles stands for Hand Made Object. In this day and age, when industrialization has made the production of collectible pieces a mechanical process, it serves as a reminder to us that we are producing more than collectibles. Each piece that is delivered from HMO represents an individual piece of art for you, the collector. To ensure that what you are receive is uncomparable in quality and design, we pour our heart and soul into the conceptualization, painting and delivery of the best collectibles you can find out there. Even the most simple of character designs across anime, gaming and comic realms are really about so much more as we strive to create groundbreaking and innovative designs!